My name is Will, I gained some popularity in 2017 on YouTube for creating a funny looking Khajiit on Oblivion and sharing it with the world. The time has now come to take my Khajiit north to Skyrim! Unfortunately, it has proved impossible for me to re-create my Khajiit in Skyrim, despite various modding tools (raceMenu etc). I am in desperate need of someone to make a simple / plain, two-part texture for my male Khajiit in Skyrim (probably just standard / original Skyrim). I don't mind the model being Skyrim-looking, it's a different game and that is understandable.. but the facial textures / colors cannot have these complex facial markings as per usual male Khajiits. I need your help. 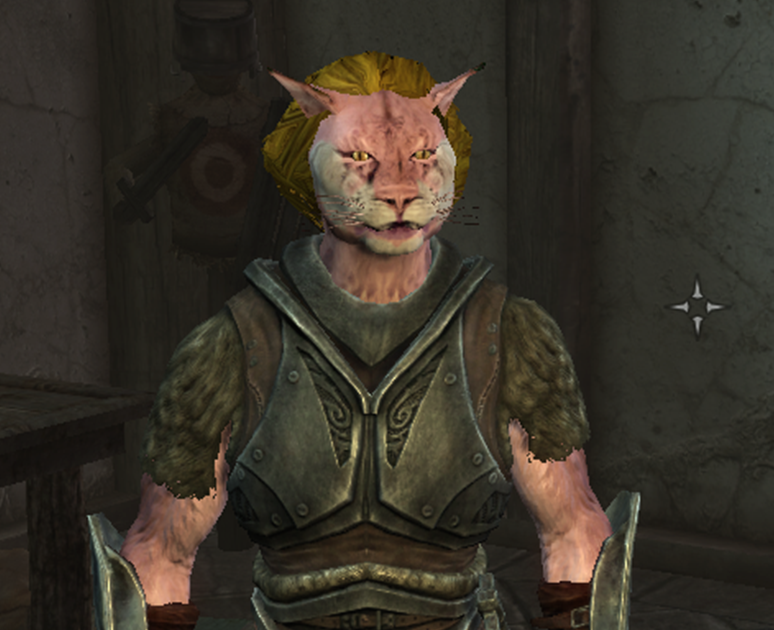 I would love to shout-out a talented texture artist on here to help me create a SIMPLE / PLAIN, two-part color scheme for my Khajiit, in a warm pink and white. That's it. Please see the attached photos. I found EXACTLY (albeit different colors) what I'm after, but the artist refuses to share their texture publicly. 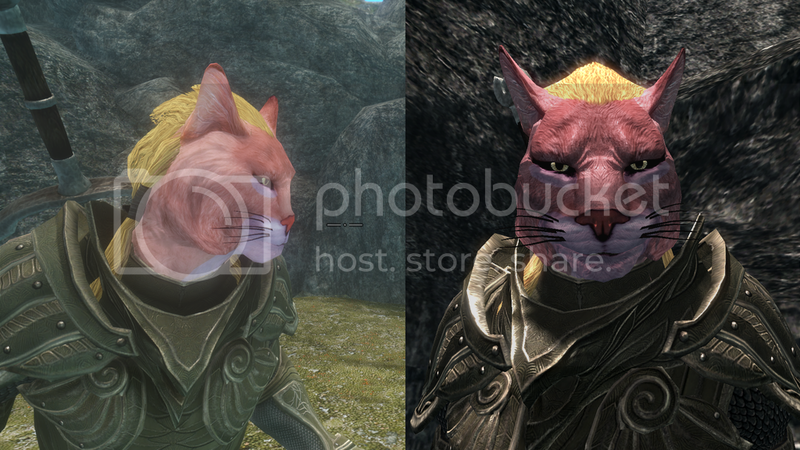 I have also included an artists rendition of my Khajiit, which has similar colors / design to what I'm after. Please also see my channel (link above) for videos of my Khajiit in Oblivion if needed. Feel free to email me ([email protected]) or reply here if you are able to help. As I said above, anyone who has experience and is able to easily help me, I will happily shout-out their social media / website in the related Skyrim video that starts off my new YouTube series. Please let me know if you are able to help! Wish I could help, but I'm an absolute noob at modding. I could make a two part texture, but it'd probably end up looking more like plastic than fur. As for meshing, that's way out of my league. Maybe if I learn a bit more, I'll do this. Why is he called Autism Cat? You should get your hands on https://www.nexusmod...rim/mods/12951/ if you wanna give him that f***ed head and face shape. This mod lets you mess with his head like playdough. Edited by HouseofRuin, 24 August 2018 - 11:56 PM. Edited by TomTesoro, 14 November 2018 - 03:19 PM. Help! my Skyrim water is transparent! how to fix?